When the Nordic Investment Bank organised a seminar on" Green Finance for the Future" in Stockholm, Magnus Billing (CEO of Alecta) and Cecilia Repinski (ED of SGDF) shared their perspectives on the roles of a policy framework and technological innovation for accelerating green finance. On the same day, the EU High-Level Expert Group on Sustainable Finance (HLEG) delivered its recommendations on how to shift Europe’s financial system from post-crisis stabilisation to supporting long-term sustainable development. Erika Wranegård, fund manager at Öhman, presented the Green Asset Wallet innovation project at the annual conference for sustainable finance in Sweden (Hållbara Finanser by Aktuell Hållbarhet and Dagens Industri). Asset management firm Öhman is a leader in sustainable investing and a project partner to the Green Asset Wallet. Erika Wranegård explained the current barriers in the green bond market such as costs to entry, and how a technology such as the Green Assets Wallet can address these in support of scaling the market. The presentation was followed by a panel discussion with Björn Bergstrand (Kommuninvest), Tobias Lindbergh (Handelsbanken), Cecilia Repinski (Stockholm Green Digital Finance) and Erika Wranegård. On 16 January, the full project consortium in the Green Asset Wallet innovation project convened in Stockholm to kick off project activities. The consortium convenes a unique mixture of green finance specialists and pioneers, technology entrepreneurs and researchers for the co-creation of an entirely new blockchain based technology aimed at supporting the green debt market. Stockholm Green Digital Finance, blockchain engineer ChromaWay, CICERO, the Emerging Markets Dialogue on Finance of GIZ, and Geographic Information Bureau are constructing the technology around three elements: Validation, Impact and Trust. Swedish Bank SEB (the green bond pioneer), Öhman and Mistra (leaders in responsible investment) and Vasakronan (the first issuer of a corporate green bond) are actively engaged offering input, pilots and testing. The team is soon to be complemented by Emerging Market actors issuing and investing in green debt. The Green Asset Wallet aims at scaling green investments by delivering efficiency and trust to the green debt market and effectively bridge investors with green investment opportunities. The innovation project is financed by the Emerging Markets Dialogue on Finance (EMDF) of the German GIZ GmbH. More information about the Green Asset Wallet here. Anna Zetterström Bellander joins Stockholm Green Digital Finance in January 2018 to lead the Green Assets Wallet innovation project. We are very excited to have Anna join the team and to develop the Green Assets Wallet together with ChromaWay, CICERO, Geografiska Informationsbyrån and EMSD, and with instrumental support from our Capital Market Partners Öhman, Mistra, SEB and Vasakronan. More about Anna here. 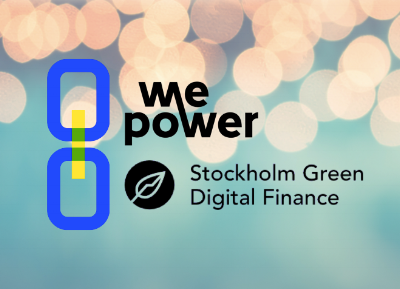 WePower accelerates the adoption of green sustainable energy systems though blockchain and share the vision of Stockholm Green Digital Finance. WePower has joined the Center's Green Fintech Network to further explore delivery on the UN Sustainable Development Goals and the Paris Agreement through fintech innovations. Stockholm Green Digital Finance and ChromaWay launch the collaboration at the Fintech Community at La Bourse on December 8, in conjunction with Climate Finance Day and One Planet Summit in Paris, France. The project, Green Assets Wallet: Scaling Green Investment through Blockchain, is a blockchain-based technology for cost efficient and immutable verification of green impacts. The technology is funded by the Emerging Markets Dialogue on Finance (EMDF), part of a project of GIZ GmbH, by Germany’s Federal Ministry for Economic Cooperation and Development (BMZ). Project partners include blockchain engineering startup ChromaWay, research institute CICERO, geographic data provider GIB, and capital market actors – including asset management firm Öhman, Swedish bank SEB, Mistra, Vasakronan and emerging market banks. Green Assets Wallet will help to effectively channel private institutional capital to green projects globally, specifically supporting green emerging markets investments. Read the press release here. The Climate KIC awarded Prototype for validating green investment was demonstrated at the Nordic 360 Blockchain Event on 8 November in Stockholm. The Prototype can be found here and consists of several clickable pages to illustrate the technology. The Prototype was developed by Stockholm Green Digital Finance and Fintech Hub Sweden, with instrumental support from asset management firm Öhman, Vasakronan, Mistra and SEB. Fintech start-up hiveonline was also part of the project. A special thanks to Erika Wranegård, Agneta Jakas at Öhman, as well as Adam Strandberg, Fintech Hub Sweden. Åke Iverfeldt, CEO at Mistra, Cecilia Repinski, SGDF, Erika Wranegård, fund manager at Öhman were moderated in a panel by Erik Wahlin of Affärdvärlden. Stockholm Green Digital Finance attended the IMF and World Bank Annual Meetings in Washington DC. Much of the official program, side events and reception discussions during the week focused on green finance and investment as a critical lever for delivery on the Sustainable Development Goals. Stockholm Green Digital Finance presented the Climate KIC awarded project for validating green investment. Ethiopis Tafara, IFC, CECILIA REPINSKI, STOCKHOLM GREEN DIGITAL FINANCE, MARCUS SVEDBERG, WORLD BANK. Stockholm Green Digital Finance has been awarded a grant from the EU's main climate innovation initiative, Climate-KIC. The winning project proposal, submitted during Climate KIC Ideation Day in Aarhus, Denmark on 22 August 2017, is titled Scaling Green Investment – Verifying and Monitoring Green Bonds Proceeds Through Blockchain Technology. The resulting 10,000 EUR grant will go towards initiating the development of a unique blockchain-based solution developed in partnership with asset management experts and fintech innovators. The full article is at the Stockholm Fintech Hub blog. Financial centers globally, from Tokyo to Toronto, pledged multilateral support for each other’s efforts to accelerate sustainability by signing the Casablanca Statement. Under the leadership of UN Environment Inquiry, Casablanca Finance City Authority – in association with Morocco’s COP22 Presidency, and Italy’s Ministry of the Environment, drew together representatives from financial centers across the world on September 28 to sign a significant accord. Stockholm Green Digital Finance signed the agreement as a symbol of the Centre’s commitment to mobilize sustainability across financial centers. As a founder member of the International Network on Sustainable Financial Centers and signatory of the Casablanca Statement, Stockholm Green Digital Finance commits to offering the network its full support to advance green priorities through innovative fintech solutions.